When the ghost of a murdered little girl suddenly appears before Felicity Bell, she’s surprised to say the least, most of all because Jennifer Dozen was reported missing, not murdered. But Jennie is very dead indeed, and before long Felicity finds herself embroiled in the baffling murder case. 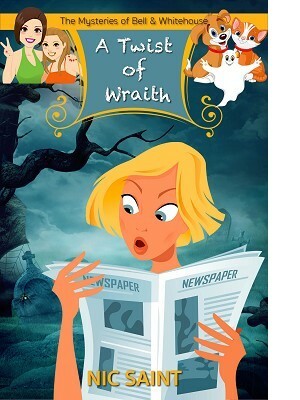 Meanwhile at the funeral home, Alice Whitehouse has her own ghosts to contend with. Three to be exact: Donna, Dora and Rock enlist Alice to help figure out what exactly happened to make them this way. And as if that’s not enough there’s her boyfriend Reece, the Hollywood superstar, who doesn’t believe in ghosts, and sics a psychiatrist on her. Soon, the entire Happy Bays Neighborhood Watch Committee is on the case, comforting ghosts, chasing leads, and even dealing with ghost dogs in the shape of Chazz Falcone’s dead Pomeranian. But when Alice and Fee discover that all clues lead to Town Hall, they know that this time they’ve bitten off a lot more than they can chew.